You protect their data. HPE RDX protects your reputation. Every time you recommend a backup solution for your client, the future of both your businesses is on the line, so you can’t leave anything to chance. HPE RDX delivers fast backup and recovery without a big ticket price. With a reliability rate greater than 99% *, HPE RDX undergoes rigorous testing to make sure that when all else fails, your client’s business never suffers the disruption of data loss. Enhance and protect your reputation by recommending HPE RDX, where all data goes business-class. Do you need a fast disk-based backup and recovery solution that can be installed in extreme environments? The HPE RDX Removable Disk Backup System is a reliable disk-based backup and recovery solution with unmatched portability, fast recovery and easy integration into a single server or branch office environment. 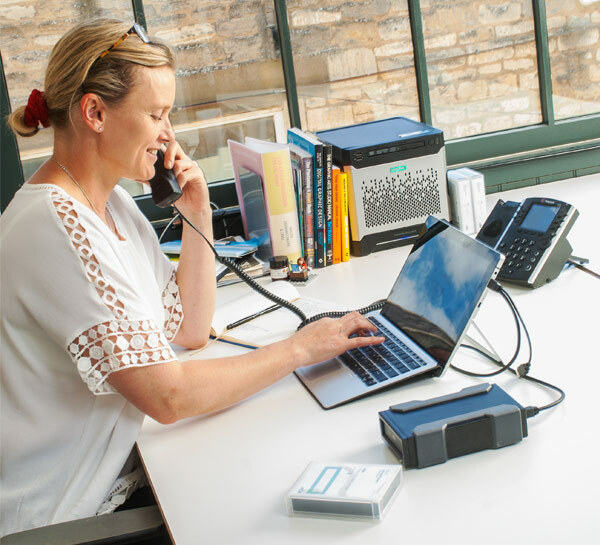 It is rugged, removable, easy-to-use, and cost- effective for remote or branch office locations, small offices or home offices with little or no IT resources. The HPE RDX Removable Disk Backup System is designed for harsh work environments where businesses need to protect, manage, transport or capture large amounts of data in less than ideal locations. The HPE RDX Removable Disk Backup System delivers a rugged, portable cartridge design protecting hard drive information and making transporting data between locations easy and more recoverable. Add a disaster recovery strategy to your business by simply rotating cartridges off site. Complement your cloud storage and implement best practices with a local backup copy that allows you faster access to critical data whenever you need it. Protecting your information both on and off-premises. Delivering hard drive data transfer speeds and built in anti-vibration buffers, to increase read/write speeds, lowering the time it takes for incremental or full backups. This leaves you free to concentrate on running your business. As backup needs grow, you can easily and affordably expand your system by simply adding more cartridges - no new is hardware required. The HPE RDX Removable Disk Backup System supports disk spanning so data can bridge multiple cartridges. Compatibility across various operating systems and virtualization platforms makes it simple to adapt into any small business environment. You can also use Fixed Disk mode for automated backups via the native Microsoft Windows operating system. Low-power ruggedized design offers flexibility to plug it in anywhere and feel confident the data is always available and safe. Cartridge style hard drive has a 97 percent survival rate compared to 0 percent for ordinary USB drives in a independent drop test. Built in static protection eliminates server or workstation failures due to statically charged peripherals. Ability to recover quickly with disk to disk backup performance reaching speeds of up to 360 GB/hr. Supports drag and drop file access making backup as simple and convenient as the click of the mouse. No need to worry about backups being larger than disk space, with disk spanning just add cartridges during the backup process, dynamically increasing the backup. Inner buffers built into the system lower disk drive vibration, increasing read/write disk performance. HPE qualified and tested, making it easy to integrate into your server storage and networking environments. With fixed disk mode capability, RDX easily integrates into multiple small business operating system environments. Contact your BackupWorks.com account Rep today at 866 801 2944 for all your HPE RDX storage needs.